Oh my goodness, had to laugh! Love the stroller - I think Harley would totally ride in one! I hope they made you something yummy! 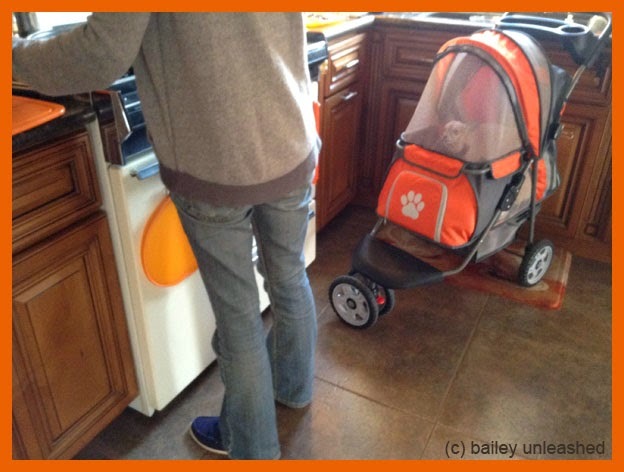 Bailey, you look so cute in your stroller and you are safe in there, that is why mommy has to keep you in there so you don't hurt your little head. Love you. At least you know what isn't good for you! It looks like just the right number of cooks to me! Way to go, Bailey. You know darn good and well that if you don't watch over them at all times,,,,they're gonna goof it up !